So Mr Harris received a Catholic burial even though we do not know what religion he was. Perhaps the coroner established that he was Catholic. Perhaps the coroner and the undertaker came up with, to them, a practical solution to their problem. 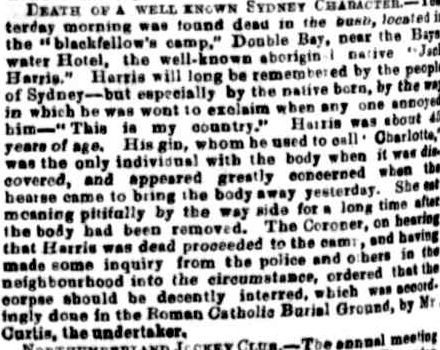 Which is to mean, it wasn't necessarily the solution Mr Harris or his family would have chosen but maybe the nature of the cultural powerlessness of the Aboriginal Sydney people meant they had no say in the matter. Be that is it may, the coroner and undertaker were driven by the need to provide a decent burial - decent in terms of their Christian faith, and also in terms of sanitary health.